A cemetary was exposed by illegal excavations at the abandoned medieval hermitage of el-Ghalida . The site was heavily disturbed by digging machinery but archaeologists managed to retrieve some remains, chiefly textile scraps, including coverings from ten funerary biers. As contexts had been utterly destroyed individual dating was not possible - but the associated settlement was abandoned in the Fatimid era, which is in line with the only radiocarbon date obtained: 890-1020AD . Figure 1 - Patriarch Ignatios lying in state. Menologion of Basil II, MS Vat. gr. 1613, fol. 134 (detail). (source: Gabriel Millet Collection of Christian Art). Figure 2 - Principle of construction of funeral biers from el-Ghalida, plan and cross-sectional views. Most of the covers show signs of wear and other clues that indicate their cloth was used for other purposes before consignment to the grave. 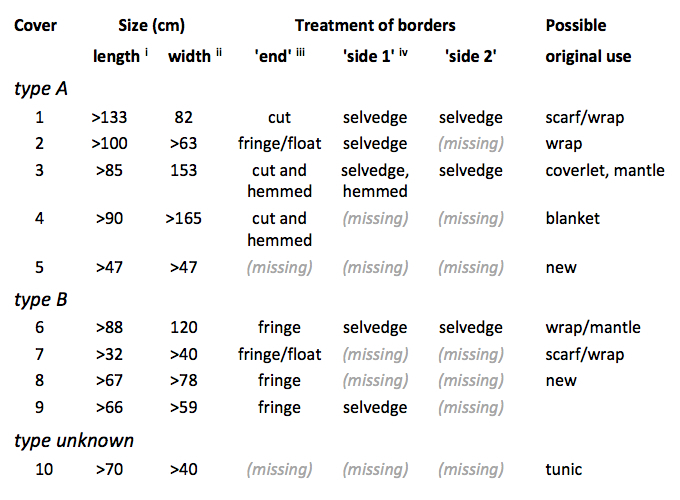 As indicated by the frequent preservation of starting/finishing borders and selvedges (see Table 2 below) in general they are large rectangular loom-pieces, frequently with fringes  - possibly wraps, shawls and mantles, or coverlets and blankets. It is likely, however, that the most immediate source of fabric for an individuals funeral is the same bedding that the monk used in life . 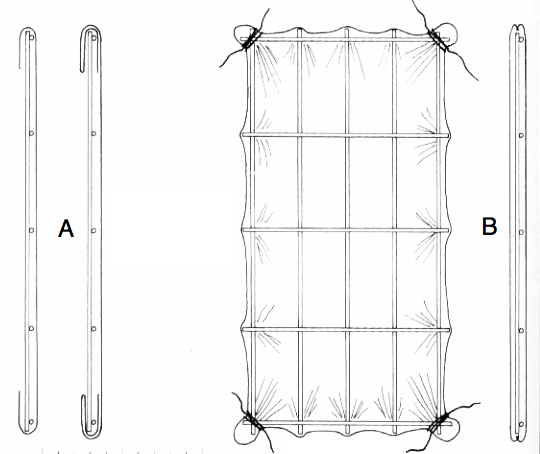 Type A covers could have been sheets or blankets, and the bag-shaped Type B covers from mattresses (strōmata). Biers were covered with homespun fabrics of various qualities (Table 1). Linen was the most frequent fibre used, but two covers (both Type A) were woolen. As is usual for Egypt, both warp and weft threads were S-spun. All cloths were 1/1 (plain or tabby) weave with a slight predominance of repps, that is, cloths with unbalanced thread counts . Decorative effects were achieved via several means - by weaving in weft stripes of contrasting colour , by texture effects such as calendaring , or by appliqué of strips of colored silk , but these must be considered in terms of the fabrics original, rather than final use. Table 1 - Fabric quality of cloths used for bier covers from el-Ghalida. 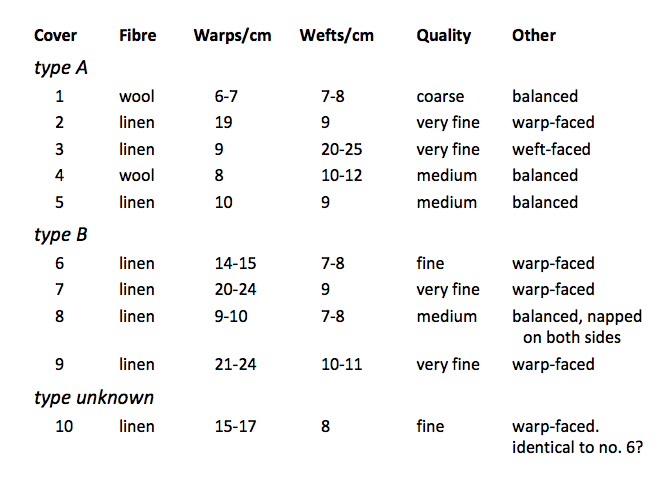 Data collated from Huber (2009), fabric quality defined by system of Hägg (1991) . Starting/finishing borders and selvedges are usually viewed as technical aspects of weaving a fabric but here they also functioned - as edges of cloths that may have penultimately been used for bedding (Table 2). Type A (blankets) - Apart from the types of fabric chosen, there is little that can be concluded about covers that may have come from sheets and blankets - none are really complete enough to guess their original size, although 80cm is the minimum full width preserved, and two are 150cm or longer. Type B (mattresses) - As mentioned, all Type B covers were made of linen. They are generally of reasonably close weave, which would retain stuffing well. No. 6 and 9 are very similar, a full loom width (c.120cm) was folded in half, lengthwise so the selvedges meet, though there is no trace of a seam here. Their sole surviving ends were sewn up - a fringed border being given a deep turn inward, then overcast . The other two Type Bs are less complete but probably made much the same, though the end of no. 7 was fixed differently - the long fringe was knotted together in bunches before the cover was turned right side out. Other seams and hems - Some cut edges were folded twice  to ~1cm depth and hemmed with overcast stitching, but these hems come from pre-funerary uses as they were all turned toward the outside of the bier cover . Apart from the already mentioned seams used to close the Type B covers, only one other construction seam is present - two lengths are tacked together along their selvedges to make a double-width piece (No. 4). No. 2 has a repair - a hole is covered from inside and out, the edges of the patches are folded twice and overcast . Sewing was generally performed with thread of the same fibre as the base fabric, the thread was doubled and plied . Table 2 - Constructive features of cloths used for bier covers from el-Ghalida. Data collated from Huber (2009). i - iv: see Footnotes . Egyptian funeral biers of the Romano-Byzantine period and later appear to show definite preference for a particular size - 60 by 120 cm, even when the fabric coverings used could have amply accommodated a larger framework . Although one must consider whether construction was limited by the length of palm ribs available, could these biers actually have been based on the size of the monk's sleeping pallets? 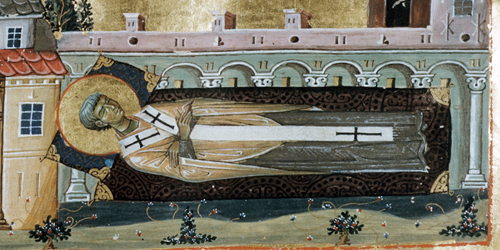 That would not resemble usual representations of bedding in Byzantine art, where the mattress is shown as long or even somewhat longer than body length. Figure 3 - The mummy known as Euphémiâan, as currently displayed in the Musées Royaux d'Art et d'Histoire, Brussels. She dates to the 4th c. AD. (source: Paetz, 2009). A two-or-three part bed suite would be more convenient for carrying, particularly if the stuffing is included . Clarysse, W. and Geens, K. (2009). Late Roman cushions and their principles of decoration, in: A. De Moor and C. Flück (eds.) Clothing the House: Furnishing Textiles of the 1st Millenium AD from Egypt and Neighbouring Countries, p.38-47. Lannoo: Tielt. Hägg, I. (1991). Textilfunde aus der Siedlung und aus den Gräbern von Haithabu, p.63. Berichte über die Ausgrabungen in Haithabu 29, Karl Wachholtz: Neumünster. Huber, B. (2009). The funerary beds from the monastic cemetary at el-Ghalida (el-Kom el-Aḥmar/Šaruna), in: A. De Moor and C. Flück (eds.) Clothing the House: Furnishing Textiles of the 1st Millenium AD from Egypt and Neighbouring Countries, p.57-72. Lannoo: Tielt. Lightfoot, C.S., Ivison, E.A. et al. (2001). The Amorium project: The 1998 excavation season. Dumbarton Oaks Papers 55, p.371-399. Paetz, A. (2009). Late Roman cushions and their principles of decoration, in: A. De Moor and C. Flück (eds.) Clothing the House: Furnishing Textiles of the 1st Millenium AD from Egypt and Neighbouring Countries, p.115-131. Lannoo: Tielt. Monastic funerary biers from el-Ghalida (Egypt), and bedding in the Byzantine world, written and webbed by Peter Beatson. (c) Birka Traders 2012-13. Not to be copied without permission.